ST. PAUL, Minn. – Many grow up learning to sing “This Land Is Your Land,” written by American folksinger Woody Guthrie. 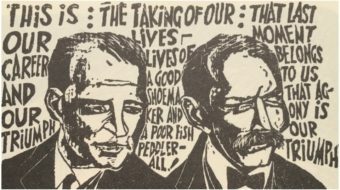 You sang about the “redwood forests,” and “diamond deserts,” but you likely didn’t learn the little-known verses seething with Guthrie’s sharp critique of American inequality. July 14, 2012, marks the 100th anniversary of Guthrie’s birth, which is being celebrated with concerts, conferences, programs, and exhibits across the U.S. So a crowd came Apr. 19 to the St. Paul, Minn. Labor Centre for the “Untold Stories” labor history series’ celebration of Woody Guthrie, sponsored by the Friends of the St. Paul Public Library. The program featured performances by Minnesota-based folksinger Larry Long and California-based labor educator and folksinger Darryl Holter. Long performed a couple of his own songs, then Guthrie’s “Pastures of Plenty,” a song sharing the travails of migrant farm workers in California. From that, Long moved right into “Maggie’s Farm,” a tune by another Minnesota folksinger heavily influenced by Guthrie: Bob Dylan. Long next performed Guthrie’s “1913 Massacre,” a song about a tragic prank by “copper-boss thug-men” in Michigan’s Upper Peninsula that led to the deaths of 73 mineworkers’ children, a true story. He closed with “This Land Is Your Land,” and got the crowd singing along. Minneapolis native Darryl Holter recounted some of his experience as a union organizer and a labor educator for the Wisconsin AFL-CIO and shared his research about Woody Guthrie. “I played Woody Guthrie songs for years,” he said, and in 2008 he won a grant to research the Woody Guthrie archives. Guthrie grew up in Oklahoma, performed in a cowboy band in Texas, then followed Oklahoma’s 1930s Dust Bowl exodus to California. 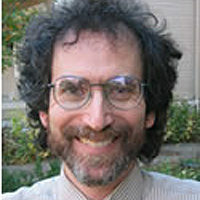 Holter’s research focused on Guthrie’s time in Los Angeles from 1937-1941. Guthrie performed live on a local radio station, at first singing traditional Oklahoma hill country songs, then writing his own songs chronicling the harsh life the “Okies” found in California. Guthrie began publishing songbooks — with no music. “He was very concerned with lyrics,” Holter noted. Guthrie also started writing new words for songs that already existed. Guthrie took some time away from his regular radio gig, Holter said, living among migrant farm workers, experiencing his first strike, and meeting radical union organizers. Those experiences crystallized Guthrie’s political thinking. Holter followed his talk about his Guthrie research by performing some little-known Guthrie songs, as well as songs like “Hooversville” — which has Guthrie-written lyrics but for which no melody is known – with Holter adding his own melody. The evening closed with Long and Holter joining together on stage. 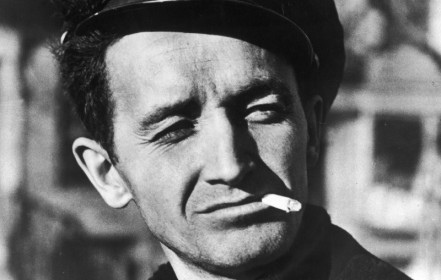 They performed several Woody Guthrie songs, including “Going Down The Road Feeling Bad” and “Talking Union.” In true Guthrie spirit, Long added a couple of new verses to “Talking Union,” urging “no” votes on Minnesota’s proposed constitutional amendments.